Melbourne Kart Centre took a team of drivers to tackle the opening round of the Victorian Country Series at the Warrnambool Kart Club with Cadel Ambrose and Peter Gigis staring for the team on Saturday afternoon in qualifying! Ambrose, in an oversubscribed Cadet 12 field of 36 drivers, was able to take pole position by the smallest of margins in 0.005 over current state champion Peter Bouzinelos setting up a big battle on Sunday. Gigis, in another big field of 27 drivers, was able to take pole position by 0.139 to also put himself in the best position for Sundays final! Gigis in another big and competitive field of 19 karters in KA3 Senior Medium was able to qualify inside the top ten in 9th spot a great result in the competitive field. Jake Santalucia, after dominating the Focus on Furniture Junior Top Guns, qualified inside the top ten in 7th spot with the young charger looking to move forward on Sunday. Xavier Avramides and Joanne Ciconte were the other drivers for the MKC team in Cadet 12 with Avramides qualifying on the second row in 3rd spot with Ciconte just outside the top ten in 13th spot! Curt Sera also represented the MKC team in Tag Light qualifying inside the top ten in 8th looking to improve on Sunday! 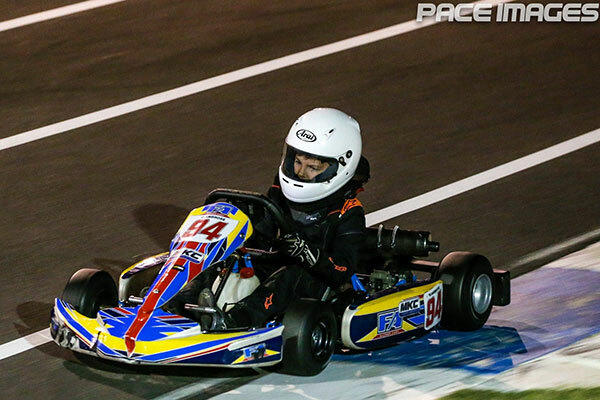 Sunday came round and Jake Santalucia in KA4 Junior Light had a consistent day racing inside the top five all day! Santalucia finished in 5th spot in the opening heat and 4th spot in heat 2 putting himself inside the top five for the final! Santalucia just missed the podium in 4th spot but collected valuable points in the series to keep him in the hunt and to be one of the drivers to watch for the rest of the series! Peter Gigis had a mixed day in both of his classes. The former state champion starting of pole position in Vic Combined Masters struck trouble and went towards the rear of the field fighting back to position 14 and setting the fastest lap in the process. Gigis continued the fight back in heat 2 making his way up to position 7 again setting the fastest lap. Gigis looking a huge threat in the final unfortunately struck trouble and had a DNF in the final leaving a thought of what could have been! The former state champion is defiantly the one to watch after the opening round in the master’s class! Gigis stayed around the top ten all day in senior medium finishing a respectful 9th in a classy field. Cadel Ambrose and Xavier Avramides were right in the front battle in the heat races! Ambrose taking a race win in heat 1 with Avramides sliding down to 7th in heat 1 with Joanne Ciconte finishing in 14th only 0.6 of the top ten! Heat 2 Avramides was in a battle for the win just falling short finishing in second spot with Ambrose and Ciconte not running in heat 2 due to the oversubscribed format. Ambrose come home in second in the final heat just behind state champion Bouzinelos while Joanne Ciconte come home in 12th spot again just shy of the top ten. In a highly competitive final Ambrose was able to hold off Bouzinelos and fast charger Tyce Hodge to take the victory and the championship lead! Avramides in a tight mid pack battle come home in 7th only 1.6 seconds off the race winner with Joanne Ciconte coming home in 15th showing consistency across the entire weekend! Curt Sera was another driver to improve on Sunday after qualifying in the top 10 he moved up to 5th in heat 1 and 6th in heat 2 putting himself right inside the top five battle and looking for a good showing in the final! Sera moved forward again in the final and was able to finish on the final step of the podium in third spot in a highly competitive Tag 125 Light another driver to watch from the MKC team in 2019! Melbourne Kart Centre Owner and Team manager James Sera was over the moon with Ambrose’s win! This weekend, Melbourne Kart Centre will be up in Queensland for the opening round of the Australian Kart Championship in Ipwsich and will also have drivers at the opening round of the Golden Power Series in Bendigo.